Boston has three hotels in the Financial District, with two nearby along the waterfront. 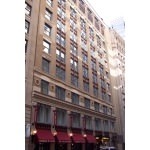 From west to east, the Club Quarters Boston hotel is located on Devonshire Street, Langham Hotel Boston is in Post Office Square, and the Hilton Boston Downtown/Financial District stands on Broad Street. The Boston Harbor Hotel is nearby along the waterfront at the end Broad Street, and Intercontinental Hotel is southeast at Pearl Street. 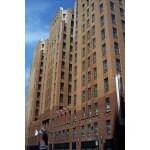 The above hotels range from three to five stars in rating. Boston is a world-class banking center, with the Financial District being the home of many global institutions. The Financial District is physically small, and is bounded by State Street, Congress Street, and Atlantic Avenue. Congress Street and Atlantic Avenue are very wide streets by Boston standards, with the Rose Kennedy Greenway park occupying the center of Atlantic Avenue. A benefit of staying at a hotel here is that the district is centrally located, with downtown Boston just west, Faneuil Hall slightly north, and the waterfront only a few blocks east. The streets in the district are quite narrow, with much of it originally used for warehouses that supported the shipping industry. The Club Quarters Boston hotel is located on Devonshire Street. Global financial institutions such as Fidelity Investments and Brown Brothers maintain offices that are extremely close to the hotel. Post Office Square, with its beautiful park in the center, is only one block away down Milk Street. A clean and modern garage is located under Post Office Square, with entrances on Congress or Pearl Streets. The hotel is only two blocks from the State Street subway station located at the Old State House, with Faneuil Hall Marketplace being another block north up Congress Street. Downtown Boston is minor walk east up Milk or Water Street to Washington Street, and then via School Street to Tremont. 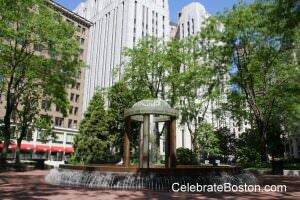 The Langham Hotel Boston is located at Post Office Square, and has the most picturesque setting of the nearby hotels. The hotel occupies the corner of Pearl and Franklin Streets, with Post Office Square being on its west side. Several routes that Horse & Carriage Tours take from nearby Faneuil Hall Marketplace pass by the hotel and the square, which is a great selling point for wedding receptions (which take photos in the park, or may depart via horse & buggy). An interesting feature about the Langham Hotel is that it was originally the Federal Reserve Bank of Boston, with its old vault now being used as a pastry kitchen. The design of the building is that of Renaissance Revival in style, and was modeled after the Papal Chancellery building in Rome. The Hilton Boston Downtown/Financial District is located on Broad Street, with quick access to most of the Financial District up Franklin or Milk Streets. If you walk north to the end of Broad Street, Faneuil Hall Marketplace is just around the corner. Long Wharf, with its many attractions like Codzilla and the New England Aquarium, is located near there at the foot of State Street. The Rose Kennedy Greenway Park, and Harborwalk path, can both be reached quickly from the south end of Broad Street. The Hilton Hotel is one of the rare Art Deco structures in Boston, and was known for many years as the Batterymarch Building. The emphasis was on height, with recessed brick columns climbing its face. The bricks gradually lighten in color as they ascend, creating an illusion that the building is even taller. The structure was likely was modeled after Barclay-Vesey Building in New York City, and is an example of rare Art Deco design in Boston. Along the ocean but close to the Financial District are Boston Harbor Hotel and Intercontinental Hotel, which are both described in the Waterfront Hotels page. Boston Harbor Hotel is located at Rowe's Wharf, and the southern part of the Financial District can be reached by walking up High Street. Intercontinental Hotel also has great access to the south side of the Financial District by walking up Pearl or Oliver Streets. Area: Financial District, Map Pin "A"
Area: Financial District, Map Pin "B"
Area: Financial District, Map Pin "C"
Area: Waterfront, Map Pin "D"
Area: Waterfront, Map Pin "E"